The Transform Now Plowshares and the sentences they received. from Nuclear Resister. You already know this if you’ve read my blog in the past few days. 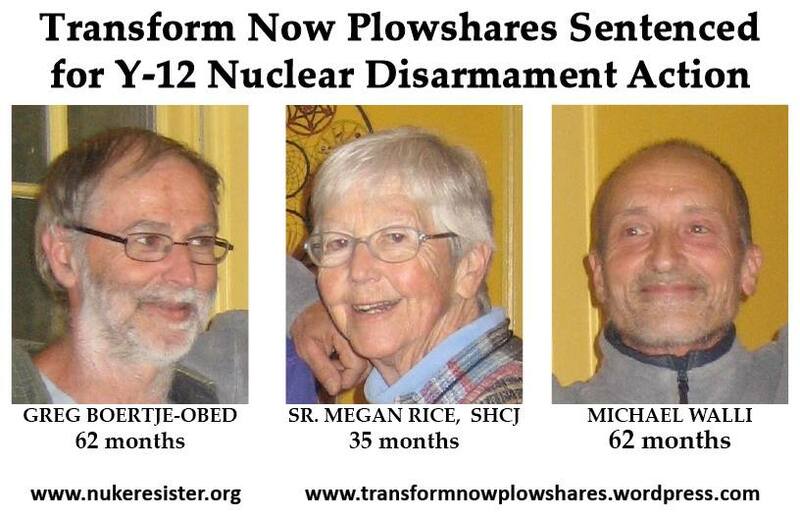 The Transform Now Plowshares, which consists of Michael Walli, Greg Boertje -Obed, and Sister Megan Rice, have been sentenced. They had already been convicted of a number of charges last July after breaking into the Y-12 Weapons Complex in Oak Ridge, Tennessee. Those charges include depredation of property and sabotage—the convictions carried possible maximum sentences of 30 years in prison. Sentencing guidelines, based on factors including history, recommended sentences ranging from 6-10 years, so the sentences represent a downward departure from guidelines and what the prosecutors were asking for. The sabotage conviction is a first for a Plowshares action. In addressing the defendants post-sentencing, Judge Amul R. Thapar made it clear that he felt there were other avenues for the protesters. In the days since the trial, I’ve received a number of emails from friends and circulated on Facebook on behalf of Sister Megan Rice. Sister Megan, an 84 year old nun, might well be looking at a life sentence, even though Judge Amul Thapar stated that he had no intention of sentencing her for life. There are numerous petitions being passed around asking for leniency or a full pardon. I like the one from Dailykos which states that she shouldn’t serve more time than the criminal bankers. But there is also one from MoveOn (which includes a request for pardon for Sister Megan’s co-defendants), and a White House.gov petition received some 14,000 signatures. I am sure that Sister Megan and Michael and Greg would love to be out of prison right now. But they wouldn’t give up the work they’re committed to. In his sentencing statement, Judge Thapar pointed out something that many supporters are not willing to accept, a point on which he and the prosecution agreed. The pattern over the years has been the same–Plowshares activists who’ve been freed tend to go on to commit more actions (both Michael and Greg have participated in other Plowshares actions). Thapar urged the defendants to work within the system–peaceful protest, petitions, voting. But people have been ‘working within the system’ since the 1950 and we still have thousands of weapons of mass destruction. The Transform Now Plowshares are Plan B. Nobody wants to go to prison; but the Transform Now Plowshares find prison far less onerous than living in a country that has some 1,950 strategic weapons on alert at all times. This is out of an arsenal of 7,700 such weapons that no one wants to talk about. And the Transform Now Plowshares and their friends would point out that in 1996, the International Court of Justice ruled that the use or threat of use of nuclear weapons is itself a crime against humanity. The court also ruled (in a split decision) that the only justification for use would be an existential crisis where the weapons were used as a last ditch defense on the country’s own territory (a Red Dawn scenario) Some experts on international law would argue that the court’s ruling means that the mere possession of nuclear weapons is probably illegal under the statute. And yet, the US under President Obama is about to commit to a multi-decade modernization campaign of both the weapons and the devices that carry them. The price tag for this effort is a minimum One Trillion Dollars. As Oak Ridge Environmental Peace Action (OREPA) activist Ralph Hutchison points out in this essay, activists have been protesting in front of the Oak Ridge Y12 facility for several years. In that time, there has been virtually no coverage of their actions by local or national media. Whatever Sister Megan, Michael and Greg accomplished, their arrests and convictions put nuclear weapons and our permanent state of war on the front page. It will disappear in a few days, of course–the media will find some easier story to cover. But the Transform Now Plowshares did not commit their break-in to secure press coverage. They do what they do because they believe that they are not allowed to stand silent while the US and other countries continue to build weapons of mass destruction. And their extreme act of witness against war and weapons of mass destruction should compel the rest of us (myself included) to actually get in the streets over these things. As I stated earlier, some 14,000 people signed the petitions on behalf of pardon for Sister Megan. How many of those 14,000 have done anything to join our voices to protest? And signing online petitions is not the same as getting in the street. Which brings me to this meme, recently going around FaceBook. A popular and embarrassing FaceBook meme. Sad but true. 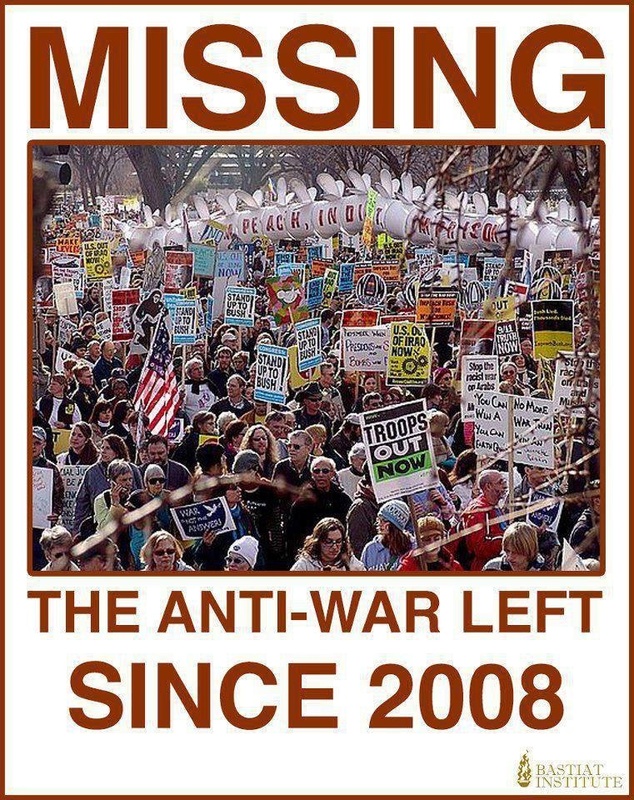 The end of the Bush era has largely meant the end of mass protest against war. We did exit Iraq (although the agreement to do so predates the Obama presidency). The field commanders in Afghanistan have figured out ways to keep casualties to a minimum, which in turn keeps the war off the front page. Our drone strikes have killed thousands and are probably themselves a violation of international law. In that funny little play I do, I call out the US first strike capacity at Vandenberg Air Force Base. That is made possible by the Navstar computer system, which allows for precise targeting for all our missiles should the order ever come through (news flash–NavStar started life as a Pentagon project for weapons of mass destruction. Now you know). There are frequent protests there, but they don’t garner any media attention. Do we want to change the game? As an activist named Katya used to put it: if ten people demonstrate, all ten will get arrested. If a hundred people demonstrate, ten will get arrested. If a thousand people demonstrate, nobody gets arrested. Adding your voice to the call for nuclear disarmament will mean we all have to get away from the keyboard. But I suspect this is the best way to honor the sacrifices of Sister Megan Rice, Greg Obed-Boertje, and Michael Walli.